California cracked winshield usage is governed by the state's Code. All relevant laws, rules and regulations pertaining to cracked windshields and windows in California have been provided below. Make sure to examine the regulations carefully and repair your window cracks or replace cracked windows. Cracked windshields, obstructed windshields, windshield replacement and other laws and regulations are different for every state. Cracked windshield laws in California prohibit driving vehicles where driver’s view of the road is obstructed. Can I drive with a cracked windshield in California? California laws prohibit drivers from operating vehicles with obstructed view of the road. There are no further details about the size of windshield cracks or chips, therefore it is up to police officers to determine if your view is impaired. Obstructed windshield regulations: No sign, poster, or other non-transparent material that obstructs visibility is permitted unless in a 7-inch square on bottom passenger side, or 5-inch square in bottom corner on driver side of the windscreen. It is unlawful to operate a vehicle when windshield or rear window is in a defective condition and impairing driver’s front or rear view of the road. California drivers who receive a cracked windshield ticket must fix the cracks within 48 hours and provide proof. Our information about California cracked windshield laws was last updated in 2018 and checked in 2019. In case any info we provided is not up to date or correct be sure to contact us so we can revise it. Thank you! Check our data with your local law enforcement or other relevant agencies! California cracked window laws or windshield obstruction regulations in certain cities or counties may be different from state legislation. While we do our very best to advise whether it is legal to drive with cracked windshield, we can not be held liable for any potentially incorrect or misinterpreted info. Very often it is up to individual police officers to determine if your clear view of the road is obstructed. California is a state located on the West Coast of the United States. It is the most populous U.S. state, home to 1 out of 8 Americans, and is the third largest state by area (after Alaska and Texas). It is home to the nation's second and fifth largest census statistical areas (Greater Los Angeles area and San Francisco Bay Area, respectively), and eight of the nation's 50 most populated cities (Los Angeles, San Diego, San Jose, San Francisco, Fresno, Sacramento, Long Beach, and Oakland). The capital city is Sacramento. Have questions about cracked windshield or other traffic laws in California? 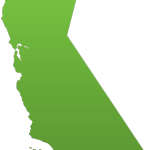 Avoid high legal fees and ask local California lawyers from the comfort of your home! Traffic law experts are on call 24/7 ready to answer and explain any question you have.